Cobber cheerleaders practice stunting. Men and wom- en on the team have varying experience levels. The student-led team welcomes anyone to tryout March 7 through 10 in Olson Forum. Photo submitted by the Concordia College Sports Information Office. What is a football game without a dozen plus cheerleaders standing on the track, cheering to the school song after a touch- down or a field goal? What’s a basketball game without cheerleaders standing on the baseline near the home bench chanting “defense”? Can you honestly say that it is a true sporting experience if there aren’t any cheerleaders shaking their pompoms in the air? Some may have forgotten about them because technically they aren’t an NCAA affiliated sport. In fact, according to head coach Jenna Sorensen, they are just a student-led organization overseen by the Athletic Department. They don’t have a roster posted on the athletic webpage and they don’t compete in competitions like a lot of cheer squads do, but they make an appearance at every foot- ball game and as many basketball games as possible to cheer the Cobbers on to a vic- tory. The squad is made up of a variety of peo- ple with varied experience. 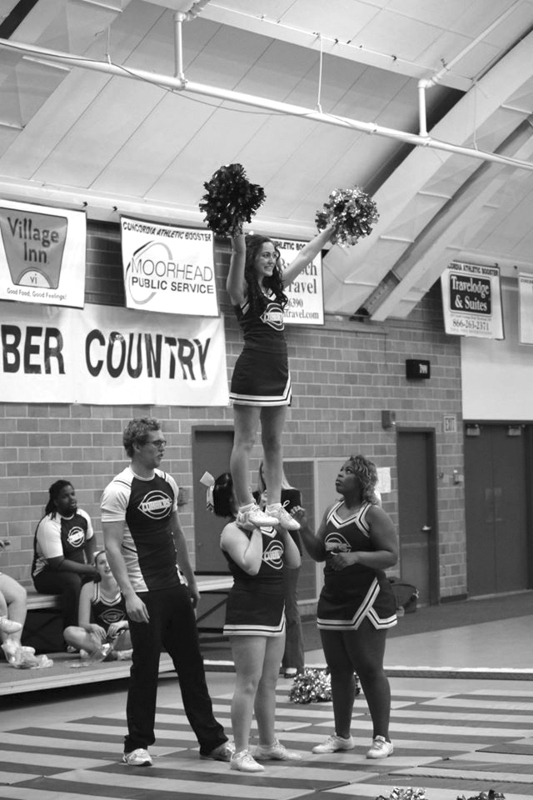 Sophomore co-captain Abigail Monroe had not even touched pompoms before she came to Concordia. Sophomore Adam Frazier has a different story. Though to bystanders it may not look that hard — just waving pompoms in the air and dancing around the sideline — Monroe said that is a very false accusation. According to both Monroe and Frazier, practices range from two to three days a week, normally running two hours long. Practice consists of a light warm up around the track, stretching and getting right into stunting. Like every other sport, when the members aren’t following coach’s rules or show up late, there are punishments to be paid. For Frazier, conditioning never hurt anyone. Anyone can do it, in fact currently the squad is made up of a generally young group with little to no cheer experience. For Sorensen there are pros and cons with a young group. Monroe believes not many people have tried out in the past because they may not realize there is no experience necessary to be a part of cheer squad, so last year when creating the tryout flyer, at the bottom she listed “no experience required to join.” The added touch to the flyers seemed to work. According to Monroe, this year at the Cobber Expo there were about 50-plus girls interested in trying out. The cheer squad is holding tryouts for next year’s season March 7 through 10. According to squad members and Sorensen, it’s worth the try. The same can be said for Frazier.